The 2018 Clinical Education Symposium will suit anyone with an interest or involvement in clinical education. Keynote topic: Culturally and linguistically diverse students in workplace learning contexts: strategies for positive, mutual learning experiences with Stacie Attrill, PhD from Flinders University, Adelaide. Have a topic, idea, experience or study to share with the group? Email clinicaledsymposium@canterbury.ac.nz to find out more. To register your attendance or request to present, email clinicaledsymposium@canterbury.ac.nz with your name and work role. Registrations close Monday 15 October 2018. The Prime Minister’s Chief Science Advisor Professor Juliet Gerrard FRSNZ is visiting UC on Friday 20 July. You are invited to participate in an All Staff Forum where Professor Gerrard will present and invite questions. The forum will be hosted by Pro-Vice-Chancellor Science | Amorangi Pūtaiao Wendy Lawson. Venue: John Britten 102 Conference Foyer. RSVP: julie.hicks@canterbury.ac.nz by 5pm Friday 13 July. Professor Gerrard’s experience, expertise and leadership was highly respected during her tenure at UC. She also said that she was pleased to appoint the first woman to the role. The role is intended to provide the Government with high quality scientific advice to support good robust decision making, and plays a vital role in promoting science and technology, explaining its contribution to society and the economy, and promoting the sector to young people as a career opportunity. Professor Gerrard started her new role on 1 July. 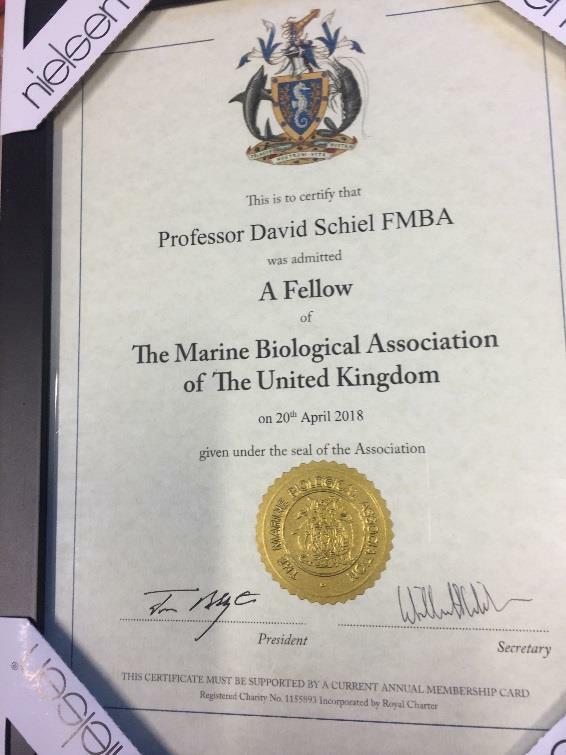 UC Distinguished Professor David Schiel was elected a Fellow at the annual meeting of the Marine Biological Association (MBA) of the United Kingdom earlier this year. Prof. Schiel is the only New Zealand scientist to have been awarded the title of FMBA, which came at the behest and support of Professor Stephen Hawkins, a former Director of the Marine Biological Association, and a visiting Erskine Fellow at Canterbury University in 2017. Professor Hawkins noted Prof. Schiel’s scientific contributions as one of the most prolific and internationally regarded rocky shore ecologists (for example, his work in Kaikōura following the 2016 earthquake), and was delighted that his achievements were recognised by the MBA. Prof. Schiel visited the MBA in 2018 as part of an Erskine Fellowship, and was hosted there by Prof Hawkins. Established in 1884, the MBA is one of the oldest and most prestigious scientific associations in marine science worldwide, it has a rich history, and has seen many highly significant scientific discoveries at its Citadel Hill laboratory in Plymouth England. Today, MBA scientists deliver an internationally-renowned programme of scientific research.